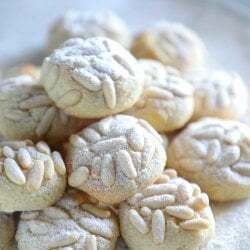 These keto pignoli cookies don’t require almond paste and are very easy to make. A tasty low carb Italian cookie that is also gluten free and dairy free! Combine the egg, almond extract, salt and sweetener in a medium sized bowl. Beat with a mixer for 2 minutes or until glossy. Add the almond flour and beat until fully incorporated and a stiff dough forms. If the dough is too dry, add 1 tablespoon of water so it will hold together. Place the pignoli nuts on a small plate. Pinch off a piece of dough and roll into a ball about 1 inch in diameter. Press the top of the ball into the pignoli nuts and then place the cookie nut side up on a parchment-lined cookie sheet. Lightly press down on the cookie to flatten slightly and ensure that the pine nuts are securely attached. Repeat with the remaining dough – you should end up with 20 cookies. Bake for 12 minutes or until just lightly golden brown. Do not over bake or they will dry out. Remove from the oven and gently transfer the cookies to a rack or platter to cool. Garnish with powdered erythritol if desired. Store in an airtight container for up to 1 week in the refrigerator, or up to 6 months in the freezer.